I am a sucker for well-crafted tile patterns and lighting fixtures throughout Walt Disney World, this should come as no surprise to anyone. What should be surprising, or at least was for me, is the ability to use restrooms as a learning, or should I say edutaining, environment. Inside Conservation Station at Rafiki’s Planet Watch in Disney’s Animal Kingdom are a set of restrooms that are broadening the places in spaces in which entertaining and educational information can be presented and absorbed. I have been in restrooms, in restaurants and airports, that use audio to give travelers helpful sayings in a foreign language, but using signs as a form of communication is a new approach to restroom awareness in my book. That’s right, signs. Above each urinal in the restroom were Whiz Quizzes. While both quizzes asked the same pair of questions, the questions themselves, which focused on the urinary habits of animals, would be entertaining to any young-blooded boy or man. The clever piece of the quiz was that in order to receive the answer to the questions guests must wash their hands, as the answer plaque was above the sink. 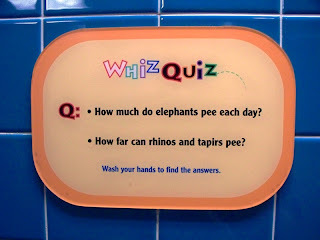 In these health conscientious times when Walt Disney World has started placing hand sanitizer stations throughout the parks and resorts, a measure such as the Whiz Quiz that encourages improved hygiene is most certainly welcome. I hope these quizzes are only the beginning of a trend throughout the parks. 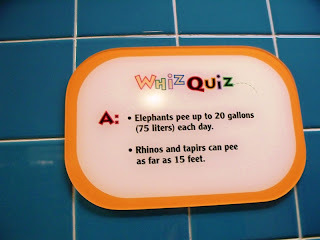 While bodily functions of animals could be used throughout Disney’s Animal Kingdom, hence the Whiz part of the quiz, I could see a variety of topics used throughout the various parks. In a ladies restroom in the Magic Kingdom a discussion about how many scales are on Ariel’s tail could be just as engaging. Over at Disney’s Hollywood Studios signs talking about how fast a car has to be moving in order to make a specific jump in Lights, Motors, Action would certainly grabbed young boys’ attention. In Epcot, simple phrases about having to use the restroom could work well in every country of World Showcase, while a dialogue about water usage per flush would be well-received in Future World. With the Conservation Station’s Whiz Quiz Walt Disney World has found a way to not only inform and send inquisitive minds reeling in a rather unique way, but it has also found a method of creating a healthier environment for all guests to play in. These signs are a fantastic way to pique interest in a given subject, and I for one hope that I am searching for quiz questions and answers all throughout the parks someday soon. Ryan - That's awesome. A new reason to visit Rafiki's Planet Watch in Animal Kingdom.